Startup ELSA với người sáng lập là Văn Đinh Hồng Vũ đã có chương trình giới thiệu Ứng dụng học phát âm tiếng Anh ELSA Speak bằng A.I và phát động chương trình “Thầy cô Việt dạy tiếng Anh hay” với những gói hỗ trợ trọn đời và những bộ công cụ tạo giáo trình riêng. 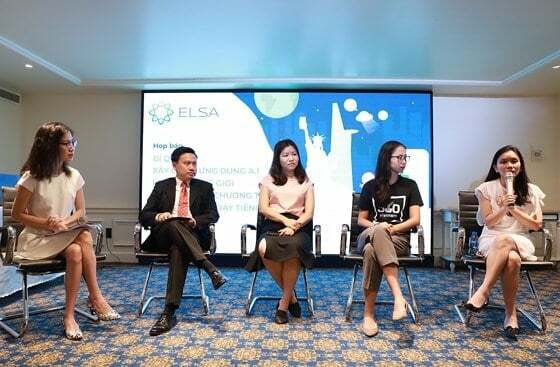 Startup ELSA with its founder, Van Dinh Hong Vu, has introduced the ELSA Speak English Pronunciation Application AI and launched the program “Vietnamese Teachers teach English well” with support packages for lifetime and individual curriculum development tools. English pronunciation application ELSA Speak has gotten funded successfully in Pre-A (before series A) with $ 3.2 million from Silicon Valley. ELSA Speak has been listed as one of four companies using A.I to change the world by Forbes, and reached the top five current A.I applications in the world, alongside Microsoft’s Cortana and Google Allo. Launched in 2016, ELSA Speak has been all the rage in English learner community in Vietnam. Many difficulties – such as speaking or listening – have been thoroughly solved thanks to the accurate voice analysis technology and intelligent feedback for learners to improve their level. There are many challenges from the beginning, ELSA’s founders are determined to focus on the single highest priority of making quality educational technology products. They work 24/7, with little capital for a great ambition to use A.I to solve the most critical problems of foreign language learners. So far, the application has nearly 4 million users in 101 countries, more than 1.6 million users in Vietnam alone. ELSA’s Speech Recognition technology is the best A.I for learning foreign languages. ELSA Speak has been voted as one of the world’s leading AI applications by Forbes, Research Snipers, Product Hunt, and the International Technology Industry. Speech Recognition can be a concept that is not too new, but a complex field and it’s extremely expensive to be able to research and develop. On this occasion, ELSA officially launches the program “Vietnamese Teachers teach English.” The program includes the following: Free account ELSA PRO LIFETIME ( cost $ 400) for the entire English teachers in the country. Launched the Teacher Dashboard feature that allows teachers and schools to automatically monitor the progress, as well as students’ progress and results, and “Build ELSA English Language Teaching Curriculum, “where teachers with advanced skills can design and build learning modules on the application. Startup ELSA with its founder, Van Dinh Hong Vu, has introduced the ELSA Speak English pronunciation Application AI and launched the program “ Vietnamese Teachers teach English well” with support packages for lifetime and individual curriculum development tools. English pronunciation application ELSA Speak has gotten funded successfully in Pre-A (before series A) with $3.2 million from Silicon Valley. ELSA Speak has been listed as one of four companies using A.I application in the world, alongside Microsoft’s Cortana and Google Allo. Launched in 2016, ELSA Speak has been all the range in English learner community in Vietnam. Many difficulties- such as speaking or listening- have been thoroughly solved thanks to the accurate voice analysis technology and intelligent feedback for learners to improve their level. ELSA’s Speech Recognition technology is the best A.I for learning foreign languages. ELSA Speak has been voted as one of the world’s leading AI applications by Forbes, Research Snipers, Product Hunt, and the International Technology Industry. Speech Recognition can be a concept that is not too new, but a complex field and it’s extremely expensive to be able to research and develop. On this occasion, ELSA officially launches the program “Vietnamese Teachers teach English.” The program includes the following: Free account ELSA PRO LIFETIME ( cost $ 400) for the entire English teachers in the country. Launched the Teacher Dashboard feature that allows teachers and schools to automatically monitor the progress, as well as students’ progress and results, and “Build ELSA English Language Teaching Curriculum, “where teachers with advanced skills can design and build learning modules on the application.